One of the most useful places I have found for finding information about relatives or possible relations is the local paper. In the island of Jersey it is the Jersey Evening Post or otherwise known by locals as the ‘JEP’. The JEP was founded in 1890 and in the main library in town (St. Helier) you can access old issues and find some fascinating stuff! There is also a History & Heritage page which you may find interesting or the great Temps Passe section. Everyone has their own way of reading the newspaper, some will go straight to the sports page while others like myself go to the back of the paper to look at the Births, marriages and deaths, also known as ‘hatched, matched and dispatched’. This has been a very useful resource for finding extra little bits of information about relatives. 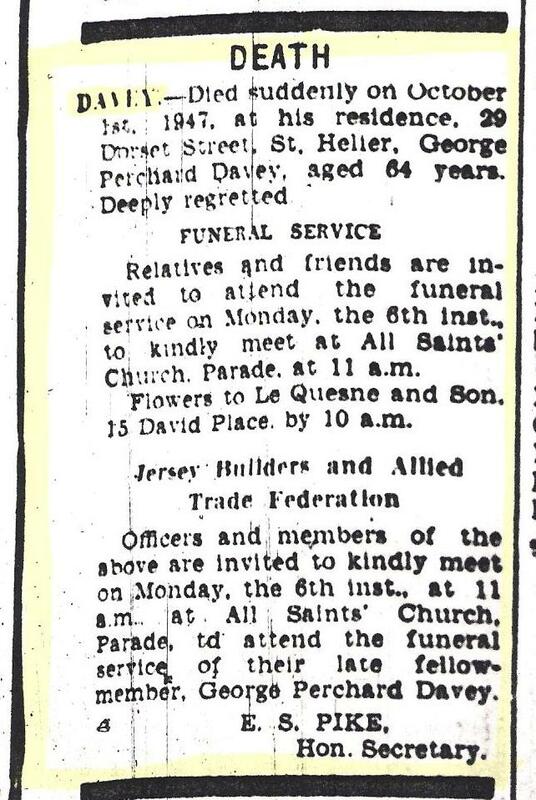 From the cut out in the picture above I can see that my great grandfather was a member of the Jersey Builders and Allied Trade Federation. I also know that his funeral was held at All Saints Church. So already I have two more things to look into and find more about. I have often cut out an extract because it includes a surname I am researching. I may not know the person but sure enough later on down the line that little cut out has proved very useful. Maybe it confirms an Aunty who is expressing her sympathy at a death of a family member or a daughter who is expressing her warmest wishes to a sibling at a birth in the family. Sometimes the connections are never made but I still hold onto them just in case!